You want to live close-in. Areas such as Bethesda, Chevy Chase, Potomac, Cabin John, McLean, Great Falls or Northwest DC are attractive for a variety of reasons. Established neighborhoods like these can offer a sense of a tight-knit community. Your commute to work will be much shorter. And, the public schools are second-to-none in the greater Washington, DC area. But, finding the perfect home that has all of the amenities you desire and is also in the perfect location is not always easy to find. You've thought about remodeling an older home, but that can be very costly, and in the end, the renovated home would not have all of the comforts and conveniences that a brand new energy efficient custom home has to offer. Is there another option for you? Constructing a new home on a lot where an older home currently stands, or building on an empty lot in an existing neighborhood is called residential infill building. Infill building allows you to live in the right location and to have the new home you want. If this sounds like a great solution for you, where do you start? First, read our article "5 Tips For Choosing The Perfect Lot For Your New Custom Home In The Washington, DC Area." You will learn about selecting your ideal living location, budgeting for your new lot and more. Next, you will need to find a homebuilder who specializes in infill building and can help you find the right property, or evaluate one that you have already identified. An experienced homebuilder will know whether or not you can actually build the home you want on the infill lot you are considering. 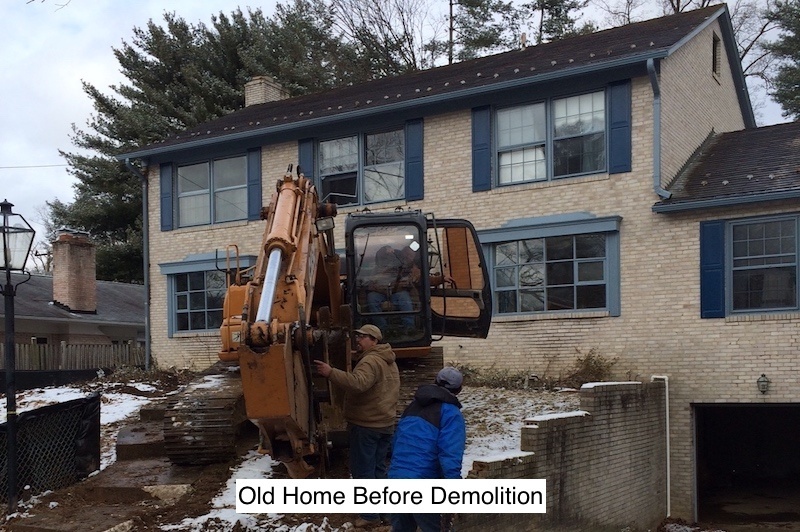 He or she should also be able to explain what is involved in tearing down an older home and what the process will be to construct your new home. How do you choose a homebuilder who will be your trusted partner and advisor? Click here to read important information about selecting the right homebuilder for you. Once you have selected a homebuilder and have found a buildable lot that meets all of your requirements, the process of developing plans for your new custom home can begin. But, what if you've searched and searched and you haven't found a neighborhood that you like more than the one where you currently live. You are happy with the nearby schools and your neighbors are good friends. However, your home is outdated and the layout does not serve your family well anymore. You've determined that remodeling would not give you all of the features in a home that you truly want. Demolishing your old home and building a new one in its place could be the answer for you. It would mean living in a temporary location for a while, but in the end, you would have it all - a brand new home in the neighborhood you already love. This type of residential infill building is becoming more common in the Washington, DC area. If you think that this may be the best option for you, have an in-depth discussion with your homebuilder so you fully understand what is involved with tearing down your existing home and building a new one on your property. Residential infill building allows homeowners to live in established neighborhoods where empty lots are not typically available for new home construction. In addition, the process of removing older homes that are often in poor condition is helping to revitalize older neighborhoods and is increasing the value of surrounding homes. The photos above illustrate what can be achieved with residential infill building. For more information about custom home construction, click on the icon below to download our free eBook.